1. Place all the dry ingredients in a large mixing bowl, mix to combine and then make a well in the centre. Pour the milk into a jug and add the egg yolks. Whisk lightly to combine. Add to the dry ingredients and mix until blended. 2. In a clean bowl, whisk the egg whites until they hold soft peaks. Fold gently into the batter until combined. Add a handful of the blueberries to the batter if you want and fold in. 3. To cook the pancakes, melt the coconut oil in a large frying pan over a medium heat and add a small ladleful of the mixture to the hot pan. Cook for about 2-3 minutes on each side, or until the pancakes are golden brown. 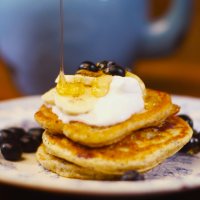 Serve the pancakes on warm plates with banana slices, blueberries, a drizzle of honey, and yogurt. This recipe was first published in Tue Dec 15 10:28:27 GMT 2015.